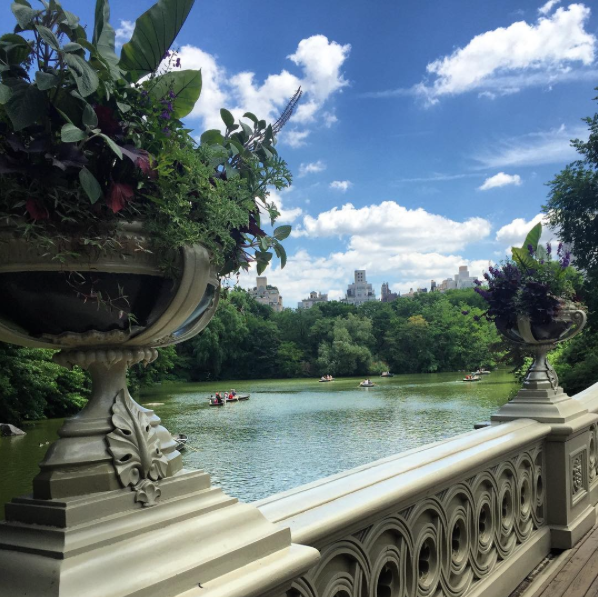 Bow Bridge, a fabulous spot to propose, or simply take in the breathtaking views of Central Park. Bow Bridge As an iconic proposal spot, and the highlight of many people’s trips through Central Park, Bow Bridge is the first cast-iron bridge built in Central Park. Designed as a compromise between park commissioners and designers, the low-lying bridge is meant to resemble the soft curve of a violinist’s bow. It also spans the Lake, connecting Cherry Hill to the Ramble. The Ravine Envisioned as an urban escape by Central Park designers Frederick Law Olmsted and Calvert Vaux, the Ravine gives visitors an opportunity to explore natural habitats, leaving the skyline behind. Hidden out of sight and surrounded by the sounds of rushing waterfalls, onlookers can experience this portion of the 40-acre woodland that is the North Woods. At the southwestern and northeastern borders are also two rustic arches – Huddlestone and Glen Span. The Mall A beautiful walkway, covered in a canopy of statuesque, sweeping American elm trees, the Mall is the only intentional straight line designed in Central Park. On the southern end of the quarter-mile pedestrian walkway, engraved granite paving stones line the path to commemorate each endowed tree in the park. On this portion of the Literary Walk, statues depict four notable writers of the era, and surprisingly, Christopher Columbus. 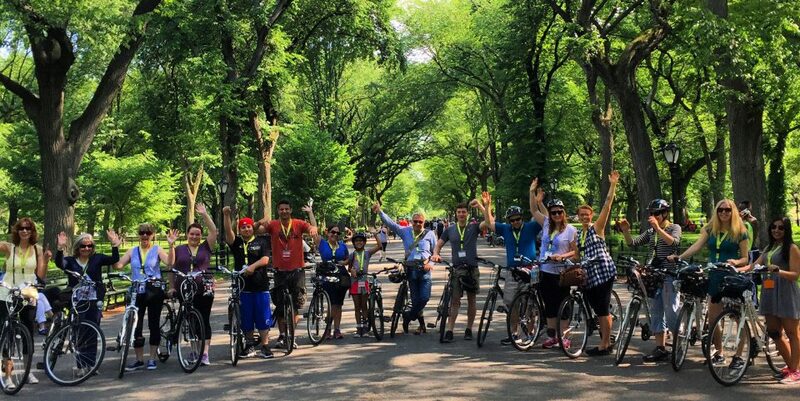 The Mall is an iconic place to take photos, especially on our bike tour through Central Park! Bethesda Terrace and Fountain As the culmination of the sweeping Promenade that is the Mall, Bethesda Terrace provides gorgeous views as it overlooks the Lake. The grand carvings on the terrace represent the four seasons that envelope Central Park throughout the year. In the middle of the Terrace is the famous Angel of the Waters statue atop Bethesda Fountain. As the only statue commissioned by Central Park, and as the first time a female artist received a public art commission in NYC, it is quite a historic work. Belvedere Castle Currently staged as a visitor center for the Central Park Conservancy, Belvedere Castle is the creation of Calvert Vaux, and overlooks the reservoir to the North. Providing the best and highest views of Central Park and the surrounding cityscape, the castle is a great place to take photos, and named for its placement, translating to “beautiful view” in Italian. It is also where the National Weather Service has taken measurements of New York’s weather conditions since 1919. The Ramble In the words of park designer Frederick Law Olmsted, the Ramble is a 36-acre “wild garden” filled with rich forest gardens and plantings sure to get the urban traveler lost in a sea of nature. Sitting on a bedrock platform, the Ramble was planted in 1859 as one of the first parts of the park. Underneath all the leaves and plants is a thriving wildlife habitat with a woodland restoration and management plan attached to it. The Boathouse As an iconic statement in the middle of Central Park, the Loeb Boathouse is a rustic building on the Eastern shoreline designed by Calvert Vaux to provide space for boat docking and storage. After falling into disrepair, a new boathouse was designed and built on the northeastern tip in 1954. As the unofficial headquarters for birdwatchers who record their sightings on a notebook inside the boathouse, its character and charm is a must to see and experience. Cherry Hill Located on a gentle slope overlooking the Lake and the Ramble, and a perfect spot for picnicing, reading or sunbathing, Cherry Hill was originally intended as a turnaround for the horse and carriages. A fantastic place for photos in the Spring when the cherry blossoms bloom on the trees, it’s sure to be a spot to remember.